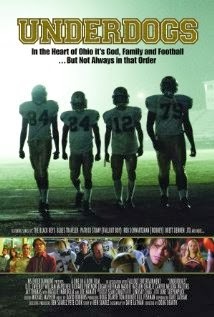 Following the tried and true formula of many a sports film, UNDERDOGS tells the “inspired by true events” story of a Louisville, Ohio high school football team of, well, underdogs. Saint Thomas Aquinas High School's footbal has been on a losing streak for years, but new coach Vince DeAntonio (D. B. Sweeney) thinks he can turn them around. Certainly quarterback Bobby Burkett (Logan Huffman) has potential, and the coach also sees hidden talents in seeming misfits like Damien Taylor (Carter Redwood) who he makes wide receiver even though he can't seem to catch a ball to save his life. Adding additional drama to the film are subplots about Bobby's dad (William Mapother) inventing a new kind of space heater, much to the chagrin of his boss John Handon II (Richard Portnow). Bobby doesn't exactly endear himself with the Handon family, either, when he begins dating Maddie (Renee Donohue) while she's technically still the girlfriend of John Handon number 3 (Charlie Carver), who just happens to be quarterback at rival high school Hoover. Of course it will all come down to one big game, but even if the Saint Thomas Aquinas team loses, haven't they already won thanks to the valuable lessons they've learned along the way? Look, there's nothing wrong with a movie like this. In fact, in the increasingly cynical and dark world of entertainment, it's kind of refreshing to find the occasional movie that isn't afraid to be optimistic and positive. Technically UNDERDOGS is a well made film, the cast (which also includes Melora Walters and Natalie Imbruglia in substantial roles) is solid, and director Doug Dearth knows how to hit all the right emotional buttons. That doesn't change the fact that it's all very rote and by the numbers, and if you've seen even one or two sports movies of this sort, you won't find much here that's fresh or surprising. So yeah, it's all incredibly familiar stuff. Still, if you're a high school football fan, or just like these sort of underdog stories and don't mind the feeling of deja vu you're sure to get from watching, UNDERDOGS should be entertaining enough. And those who live in the area the story is set (and filmed in) might be slightly more inclined to check it out since it's not very often small towns like Louisville and neighboring North Canton get to be on the big screen. 2 out of 4 stars.